Rancho del Lago is a spectacular estate property just 4 miles (10 minutes) from the heart of historic downtown Durango and 28 miles (35 minutes) south of Purgatory Ski Resort. This Turtle Lake residence is unlike any other set in a gorgeous meadow with majestic views of the surrounding mountains, unique rock outcroppings, and Colorado bluebird skies. The usable 20 acres showcase a main residence, guesthouse, and over-sized two car garage. This is the listing for the main house ONLY. The homes can be rented separately or together, as each has substantial privacy buffers from the other. 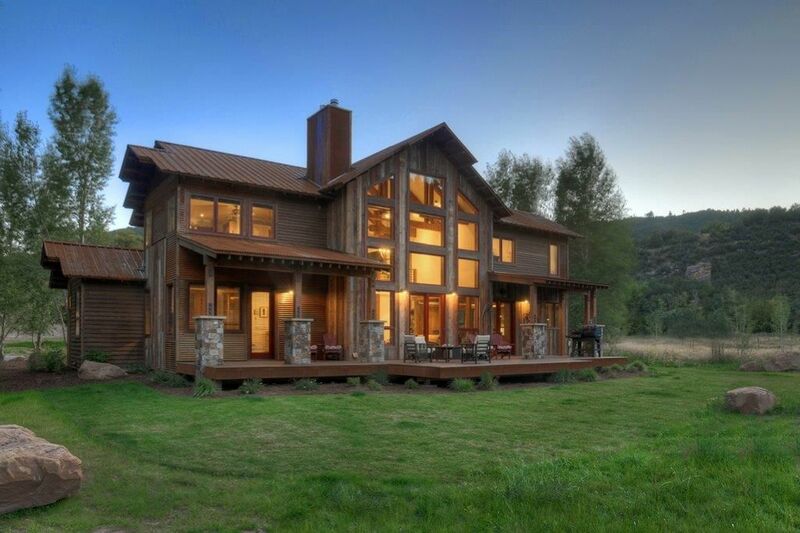 The exterior of the homes incorporate a gorgeous mix of corrugated metal, stone and reclaimed barn wood creating the quintessential Colorado mountain estate. The grounds are fenced for horses and include gorgeous landscaping around the house with woodlands, aspens, cottonwoods and healthy pastures beyond. The 3,100 square foot features amazing views out the floor-to-ceiling windows. The wood burning stone fireplace, hardwood floors and exposed wood trusses create a cozy spot to relax with friends and family. The open kitchen and dining room overlook the living area creating the ideal entertaining environment. The gourmet's kitchen features a double oven, 6-burner gas range top, quartzite counters, farmhouse sink, stainless steel appliances and an island with bar seating. Located just off the kitchen is a true mudroom with a door to the outside to remove muddy boots and clean up at the utility sink. The private master suite is located on the opposite side of the main level with a gas fireplace, private walk-out patio and big master closet with built-in shelving. The en-suite bath features Spanish-style detailing, dual vanity, soaking tub and separate shower. There is also a small office off the main living space. Upstairs is an additional loft living room and bedrooms 2 and 3 each with their own private bath as well as a 4th bedroom. The detached garage can be accessed from the house via the covered breezeway. Access to thousands of acres of National Forest are within minutes; the Colorado Trailhead is a short walk up the road. This lakefront property is one of seven properties on Turtle Lake with roughly 600 feet of water frontage. The house was pretty perfect for our family!!! Thank you for the review, Shannon! It was a pleasure to host you and your family :) You were wonderful guests and we are so glad you enjoyed the home and Durango area. Premier Vacation Rentals looks forward to hosting you again in the future. We had a wonderful stay in this rental. Very spacious and clean! The kitchen had everything we needed. We were a large group and there was plenty of room to play games and enjoy the fireplace. My husband asked about sledding slopes for the grandkids. Keith made sure there were inner tubes available in the garage for our use! Thank you so much. The children had a blast. The home we rented was very spacious and having a garage was so nice. Although the surface areas were clean there were a lot of cobwebs in places and dirt and bugs behind some doors(half bath). We could not use soaking tub in master bath because there was no plug for drain and only two jets out of three worked in hot tub. No firewood provided and we could not use some around house because it was wet. The kitchen was well supplied and beds were comfortable. I wish there would have been a place to walk near home but busy road nearby keep us from doing that. The home was very nice and we did enjoy the deck. A deep cleaning should be done but overall we had a good time. Thanks so much for taking the time to write a review regarding your recent stay with Durango Premier Vacation Rentals. We're so glad to hear you enjoyed your stay! We conduct deep cleans twice per year in the off season to address the items highlighted in your review. The fall deep clean was completed in late October following your stay. Relative to walking near by, this home is located near two great local hikes -- the Colorado Trail and Falls Creek Open Space. Next time you stay with us, give us a call we're happy to recommend local hikes/walks that you can enjoy during your visit! We had a wonderful time! Great facility and close to downtown Durango. We have many great memories of our time there!